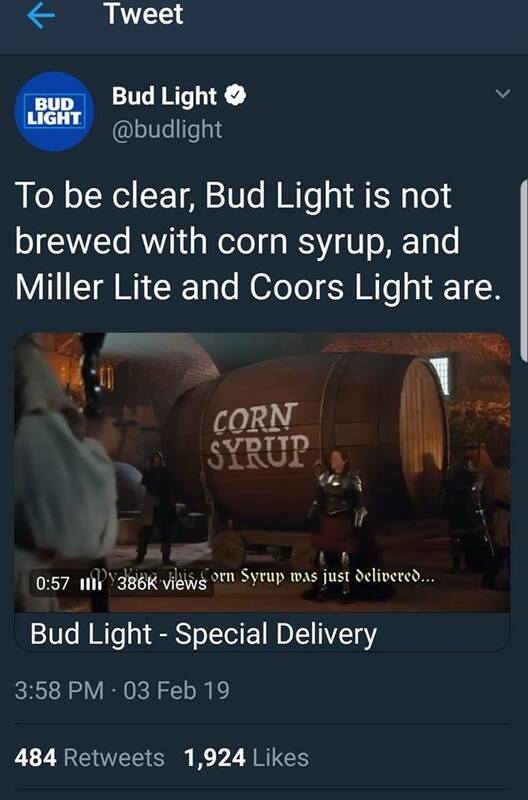 "Bud Light", a lower carbohydrate beer produced by Anheuser–Busch InBev of Belgium, made waves at the Super Bowl, among beer experts and competitors at least, by assuring their customers they did not use corn syrup. Beer experts were baffled at the claim because corn is simply a choice for a sugar primer to feed the yeast that will create alcohol and bubbles - biologically it makes no difference if it's corn sugar or cane sugar because it's fermented out. (2) They could also use beets or rice or other things but the goal of a light beer is to have alcohol with fewer calories so they use just enough sugar, in whatever form, to get the job done, and corn syrup mixes better in water than crystal sugar from whatever plant, which is important when you need a consistent, mass-produced product. Instead of corn syrup, "Bud Light" was basically bragging that they use "rice syrup" because their slurry is rice. How is that superior? It isn't, and if MillerCoors/Molson Coors really wanted to turn the tables on "Bud Light" they could do an ad claiming their product has no arsenic. Some academics, and certainly food pundits, latched onto High Fructose Corn Syrup as a concern because every year there needs to be something to throw culture into a panic about. They began to distinguish it from bleached white table sugar (yes, that was supposedly the healthier alternative) even though experts know that HFCS simply has 55 percent fructose rather than the 50 percent corn syrup or table sugar has. What also has 55 percent fructose? Honey. So the people who said HFCS was unnatural were also arguing honey was unnatural. I am not here to defend bee vomit but it is "natural." And that is a meaningless distinction. Though beer sales went up last year big brand beer is a dying market so Anheuser–Busch InBev - a Belgian company, a country where their beer is literally made with liquid candi sugar - may have been preying on the memories of their middle-aged drinkers who recall hearing the term corn syrup in some war started by Center for Science in the Public Interest (or pick your favorite food trial lawyer group) and assumed that meant HFCS. So they came up with a clever way to make their International Agency for Research on Cancer (IARC) Class 1 carcinogen (alcohol) sound healthier than their competitor. "Bud Light" is instead saying their rice syrup is superior but we can detect something really scary in rice - arsenic. You may recall a few years ago that Dr. Oz attacked apple juice because of arsenic in it. He didn't understand that there is a difference between inorganic and organic arsenic, but a celebrity surgeon who ironically embraces alternatives to medicine is no chemist. That said, he has to know "the dose makes the poison" and still ignored it. The trace levels of arsenic in apple juice were so low that it would take a human drinking 11 gallons a day 2,000 years to get a meaningful amount. But rice is a different story. Arsenic is not an additive in rice (or any food) but also can't be prevented because it is not just man-made, it also comes naturally from air, water, and soil. And due to the way rice grows, it is absorbed a lot more than in apples. It doesn't matter if your rice is "organic" or conventional, it has arsenic. But that is a debunking for another article. (1) If your lettuce has "no GMOs" that is because there is no GMO lettuce. And your organic certified lettuce could have been made using the predecessor of GMOs, mutagenesis, which is literally chemical and radiation baths to create mutations. But if you don't understand food you may buy a "no GMO" sticker instead of regular lettuce because of nocebo thinking. (2) Even Europeans recognize this. Though they ban GMOs (because Europe's largest applied agriculture group, BASF, uses mutagenesis and GMOs were America) they allow GMO feed for animals, because they know that the feed is not turning the cow or the milk into "GMO food."